WEDNESDAY, Jan. 10, 2018 (HealthDay News) — Weightlessness apparently causes astronauts’ body temperatures to run a little hot while in space, a new study reports. The researchers used forehead sensors to monitor the core body temperature of astronauts on the International Space Station. Measurements were taken before, during and after their venture. When at rest in space, the astronauts’ body temperature averaged 100.4 degrees Fahrenheit — 1.8 degrees higher than the 98.6 degrees considered a normal body temperature on Earth. 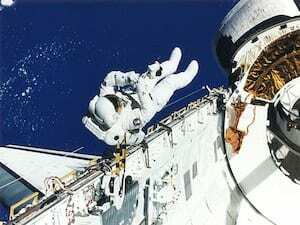 During exercise while in space, the astronauts’ body temperature often exceeded 104 degrees Fahrenheit, the study found. The astronauts’ resting body temperatures did not increase as soon as they went into space, but rose gradually over 2.5 months. “Under weightless conditions, our bodies find it extremely difficult to eliminate excess heat,” study leader and space medicine specialist Dr. Hanns-Christian Gunga explained in a news release from Charite University Hospital in Berlin, Germany. “The transfer of heat between the body and its environment becomes significantly more challenging in these conditions,” he said. The reason is that sweat evaporates more slowly in space. That’s why the astronauts overheated fairly quickly when exercising in space, he said. Large changes in core body temperature can impair physical and mental abilities, and may even be life-threatening, according to the researchers. That makes this line of research valuable in protecting the health of astronauts on long-term space missions. “Our results also raise questions about the evolution of our optimum core body temperature — how it has already adapted and how it will continue to adapt to climate changes on Earth,” Gunga said.